As I said last week, I spent this past weekend exploring Edinburgh, Scotland. That’s pronounced “Ed-en-Brah,” so not how it looks at all. I went with my program group, CIS Abroad. Although we were there for a short time, we fit a lot of amazing experiences into three days. On Friday we took the train from London to Edinburgh and arrived in the evening, with just enough time for exploring the High Street and getting dinner. Saturday we had a full day, packed with discovering different castles in the Highlands. The coolest castle that we saw was Doune Castle, which actually translates to “Castle Castle.” As the tour guide said, “It’s a castle so nice they named it twice.” The super neat part about this castle is that it has been used for many different films, such as Monty Python and the Holy Grail, Outlander and Game of Thrones. In Game of Thrones it was used as the town of Winterfell, which I thought was awesome, considering I love the TV series. 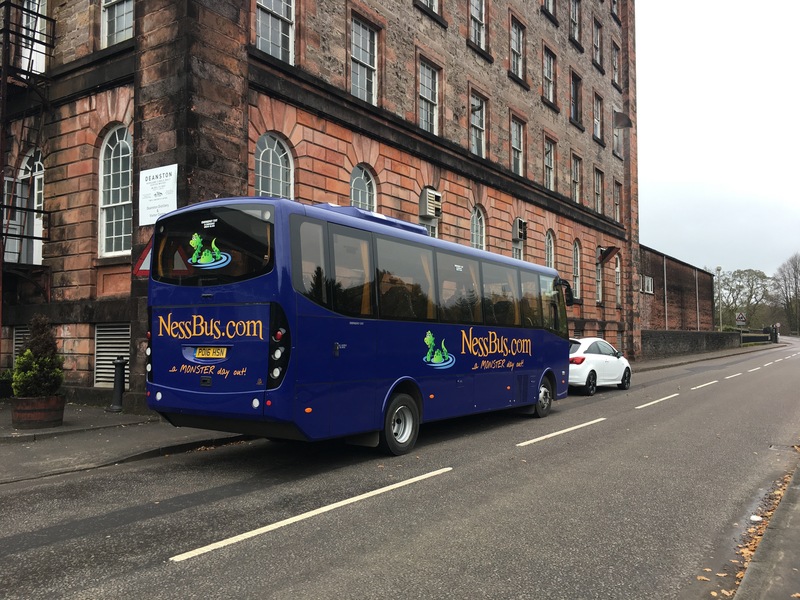 Our tour bus in front of Deanston Distillery, where Scottish whiskey is made. After the Doune Castle we went to Deanston Distillery, which was established in 1966. We went on a tour of the facilities and saw how they made single malt Scottish whiskey. It was neat to see all of the effort that goes into it. After they make the concentration of barley, malt and sugar, it has to age in the cask for at least 12 years. They showed us the storage room where they keep all of the casks, and there had to be thousands in that cellar. One of the barrels was from 40 years ago; the tour guide said that this barrel would sell for about 4,000 pounds a bottle, which would be about 5,300 American dollars! I thought that was insane, but I guess that over the years of the concentration being in the cask, they will loose a lot of it due to evaporation. The last day we had some free time to explore the town and shop for souvenirs. 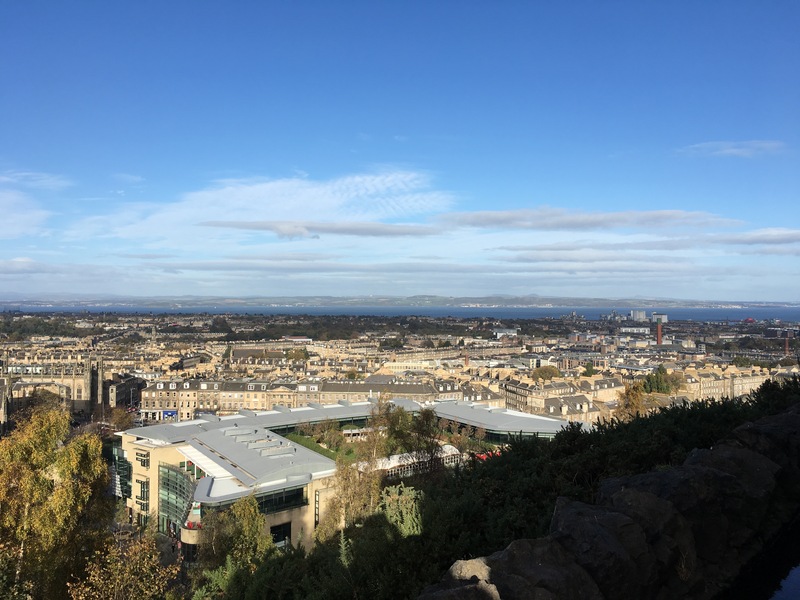 We also saw the most beautiful view of Edinburgh. It seemed like we climbed a million stairs up this hill to see the view, but let me tell you it was totally worth every step. Scotland now has a special place in my heart and I will definitely be back to one of the most beautiful places on earth. Have you ever wondered what it’s like to live in a castle or palace? Good, me too! Being in England I have made it a point to see as many palaces and castles as I can. I find them so interesting, because every single one has a different story and is enriched in elaborate history. 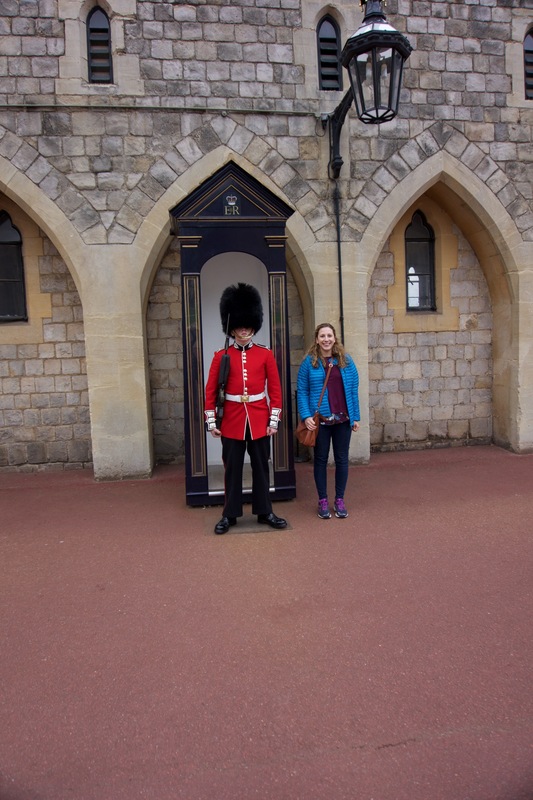 So far, I have been to Buckingham Palace, Blenheim Palace, Lamport Hall, Basildon Park, Windsor Castle, Boughton House and the Tower of London. It’s hard to decide which one is my favorite because they all are so unique. When I was younger (who am I kidding, even now) I think it would be really neat to live in a castle or palace with secret rooms and decorations. 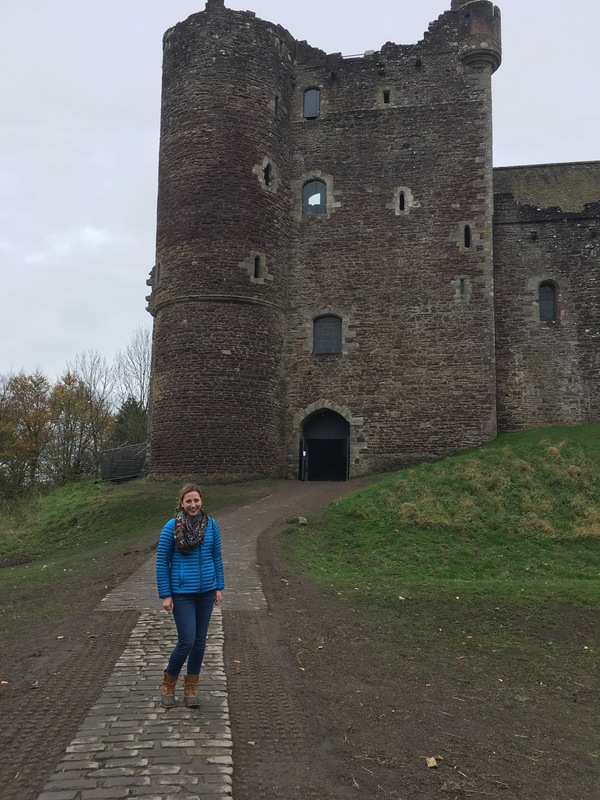 I’ll tell you a little about my most recent adventures touring through medieval castles and palaces. First stop: Buckingham Palace and Windsor Castle. The royal family resides at Buckingham Palace and Windsor Castle at different points in the year. Buckingham Palace is the Queen’s official royal home and has been the official residence of Britain’s monarchy since 1837. It was amazing to be able to step foot into the Queen’s home. The palace is only open to the public for four months out of the year while the Queen is at her summer home. I was able to tour the state rooms and see the collection of gifts that were given to the royal family from all over the world. 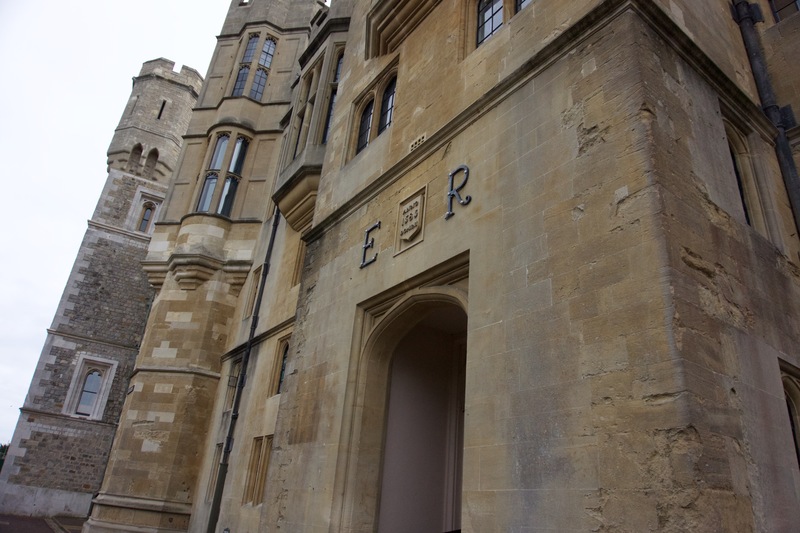 When the Queen is not at Buckingham, she is at Windsor Castle, which is one of the largest royal castles in the world, built after the Battle of Hastings in 1066. Since then it has withstood the Blitz, fire and devastation and still stands today. 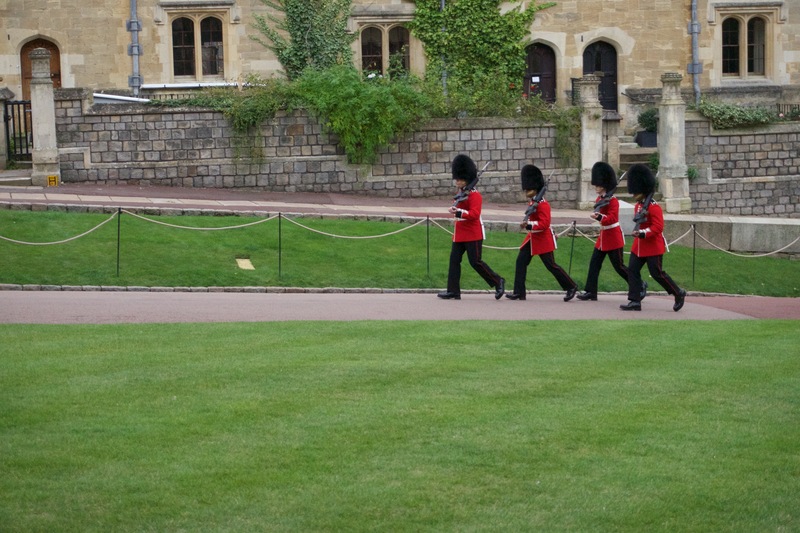 When I toured the castle I was able to see the changing of the guards, which was neat because they blocked off the whole street and sidewalk so that they could change the guards without any disturbance. Check back next week for exciting stories about my weekend excursion to Edinburgh, Scotland! One thing that I value the most is family and friendship. Luckily my parents have arrived to visit me this week. 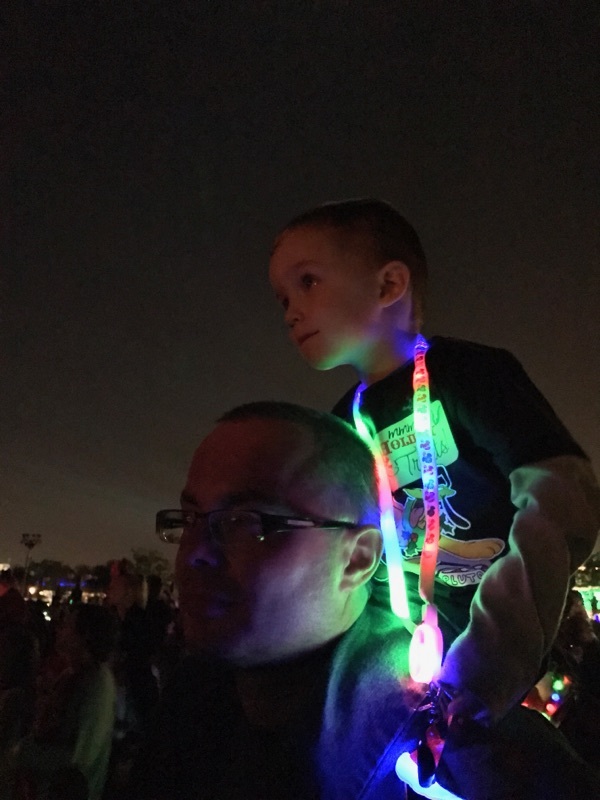 Being away from my family has not been the easiest for me, so I am very thankful that my they are here for a short time to join me in my adventures. I am also thankful for friends that have turned into family, like the Hunters. 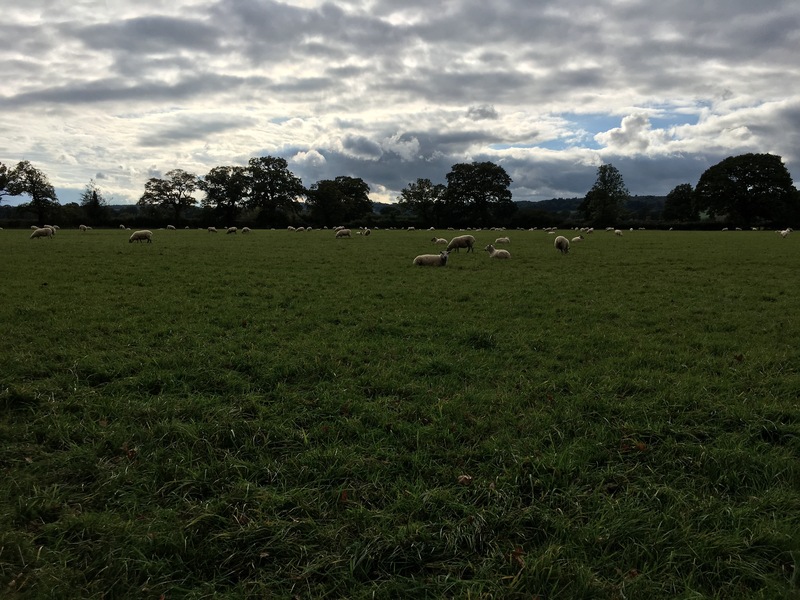 This week we have been visiting the Cotswolds in the good ‘ol countryside. 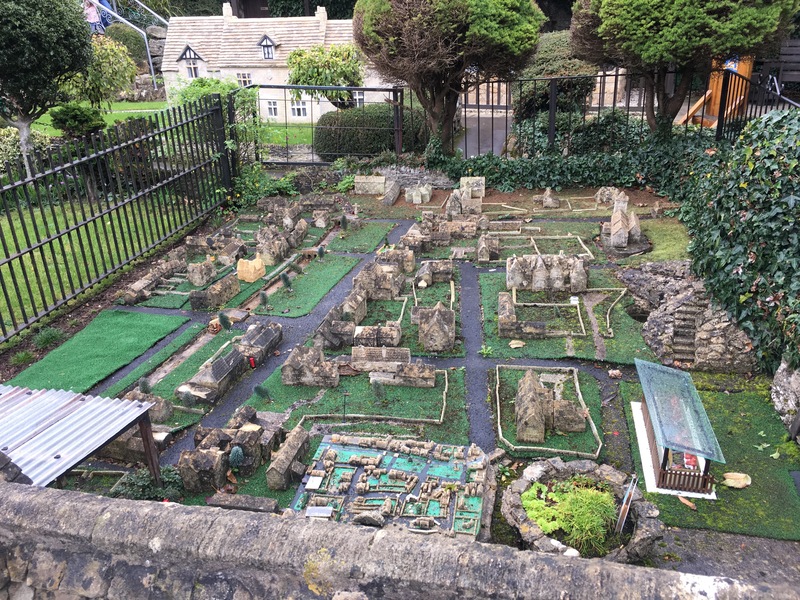 Our first stop was Cheltenham-Burton-on-the-water, where the miniature village is located, which was opened in 1937. It consists of a miniature village of the actual village. It was really neat walking around the tiny village, because it sort of acted as a map for the real village. For example, we had afternoon tea at Smiths Restaurant, which was in the same place as it was in the miniature village. Our next journey was walking the footpaths of Moreton-in-Marsh. It was absolutely stunning, with herds of sheep on the rolling hills. Next we checked into our hotel, The White Hart. 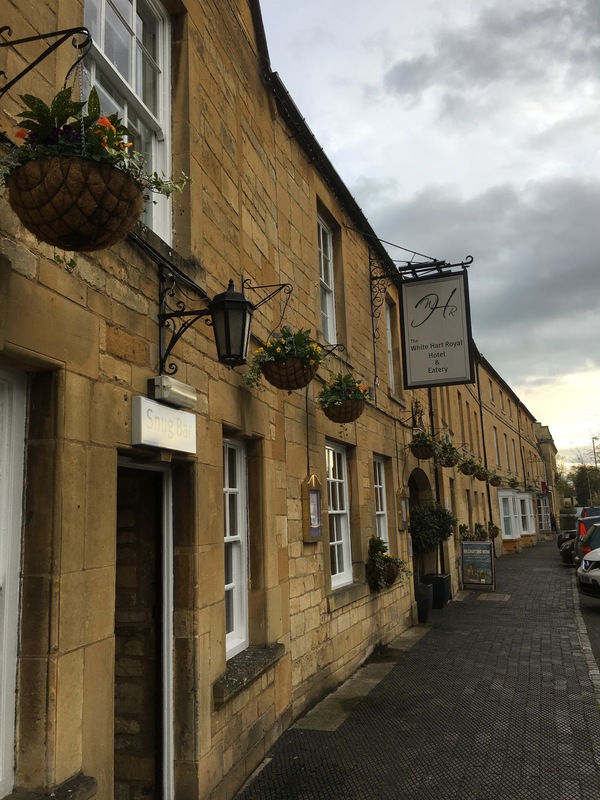 This hotel dates back to the 1500s, and some parts of the building date back to the 1400s. The reception desk was located on the original cobblestone roads that were used as a carriage way. This hotel has had some notable guests including King Charles I first who stayed there once during the Civil War and never paid his bill. The unpaid bill still hangs on the wall of the hotel today as well as a copy his signed death warrant. I thought the rooms were magnificent: I had never stayed in a hotel with such rich history within its walls. There was a market the following morning where there were numerous things to look at. 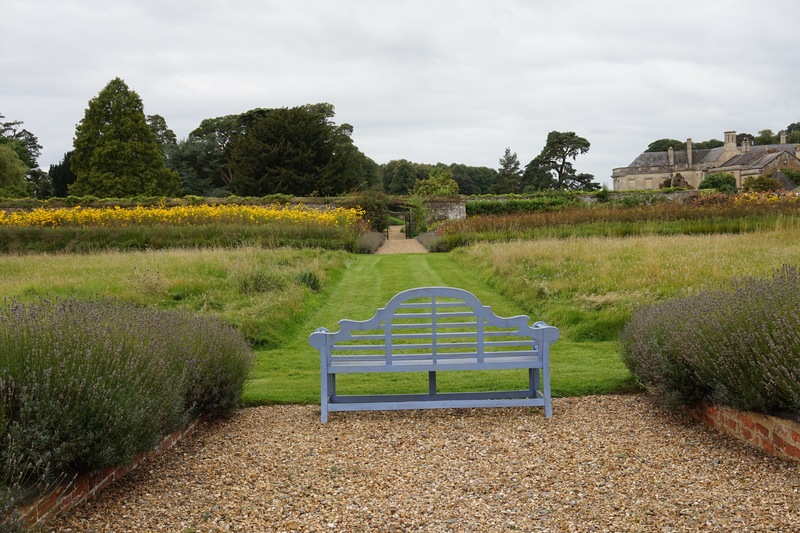 After the market we headed to the Batsford Arboretum, where we were surrounded by nature and beautiful buildings. In the Arboretum we saw St Mary’s, a stunning church that was built in 1291. Our next stop was to Stratford, William Shakespeare’s birthplace. It was amazing to see where someone so influential in today’s literature was born and raised. There he met his wife, Anne Hathaway, who lived in a small cottage with her family until they married. Together they had three children, but only two of them survived. 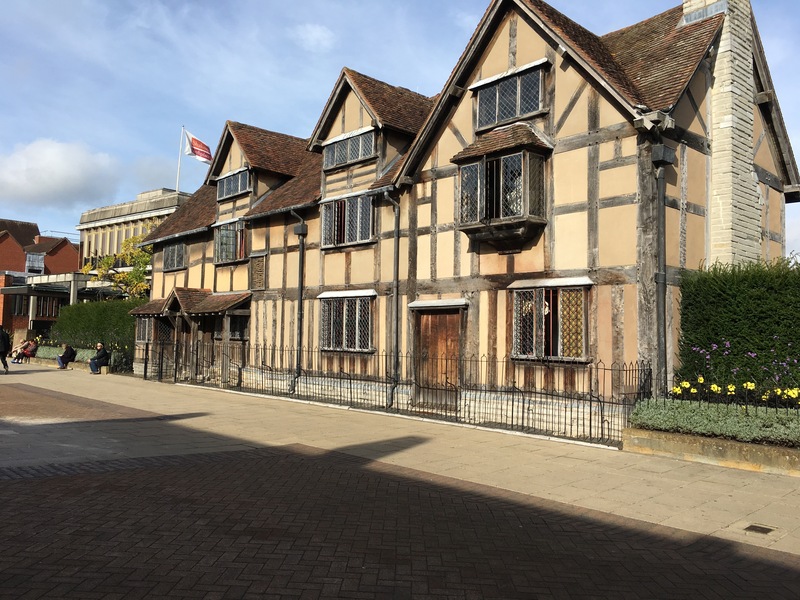 Later Shakespeare bought Anne and his daughters the largest house, Stratford-upon-Avon. Stay tuned for next week to see how introducing my parents to the city of London went! After my first couple weeks of classes at the University of Roehampton, I’ve already learned that there are some major differences between classes here and my courses back at UC. 1. It is normal to meet for classes only once a week, but for three hours and sometimes four. I have classes Wednesdays and Thursdays, so either way I have a long weekend, which is nice, because I can explore and travel in my free time. 2. Classes are composed of lectures and seminars, which back home would mean the same thing. But here there is an hour lecture, sometimes with multiple instructors. Then you will have a seminar with one instructor for about two hours. 4. Back home, students would know the required reading materials ahead of time before they even thought about starting school again. Here, there are no reading lists that are sent out prior to the start of classes. This instituted some anxiety for me, because most students here rely on the library to have the books they need for class. I am used to having my books a month before school starts, and I like to rent them from Amazon or Chegg, because that means you can write and highlight in them. 5. On the lines of reading materials, it could be expected for you to read an entire book by the next session, so in a week. In one of my classes I was to find this book by Charles Dickens and come prepared to discuss it in class. I couldn’t find it at the library, so I was worried I wouldn’t get the book on time, but the I just ordered it off Amazon. 7. Instructors have a different relationship with students. Back home at UC, I’d have professors trying to help me in any way possible if I had a question or concern, but it’s a bit different here. For example, on Wednesday my name wasn’t on the attendance sheet for the class, and I knew I was in it because it was on my timetable. So I asked the instructor, and he walked away from me. Better luck next class, I guess? 8. Independent learning is proponent in all classes. Don’t get me wrong — back home I do my fair share of independent learning, but sometimes you don’t have to read every single word in every chapter prior to class, because professors sometimes just read out of the textbook anyway. Here it is expected that you are reading the materials, because the instructor won’t go in depth about what you were to read during lecture. 9. You may only have your grade riding on one exam or paper. Yes, thats right, ONE. This was a shock to me, because back home we would have tests, quizzes, participation, homework and attendance all compiled together to give an overall grade for a class. So far in my classes I have one project or essay that I will submit in November that counts for a majority of my grade. 10. Grades might not be out right away. In orientation they were saying grades could take a few months to be finalized. WHAT? Back home we don’t even have to wait a few weeks for our grades. I guess we’ll see about that. I have arrived! Roehampton is a very beautiful campus with incredible architecture. It is composed of four colleges: Southlands, Digby Stuart, Froebel and Whitelands College. I will be living and and attending classes in Southlands College. This week has been super chaotic. I’m getting adjusted to living in a dorm, being in a different place and learning new things about the culture, such as learning to rely on public transportation, which is new because I am used to being able to drive my car wherever I want to go. Now I have to actually think about where I want to go and what modes of transportation I can use. Despite the mini challenges , have had lots of time this week to explore the wonderful city of London. I have had many orientations this week, as well. It is strange that they are referring to us as “freshers” because I am not a freshman at UC, but I need to remember that it is my first time here. Saturday we went on a photograph scavenger hunt of London, and it was exciting. We created our teams and were given a list of places we needed to go, but there were not answers, so I didn’t know how we would know if we were at the right places or even close to them. Maybe that was the whole point of the outing, because my group ended up making our own way and some of the best adventures are not planned. 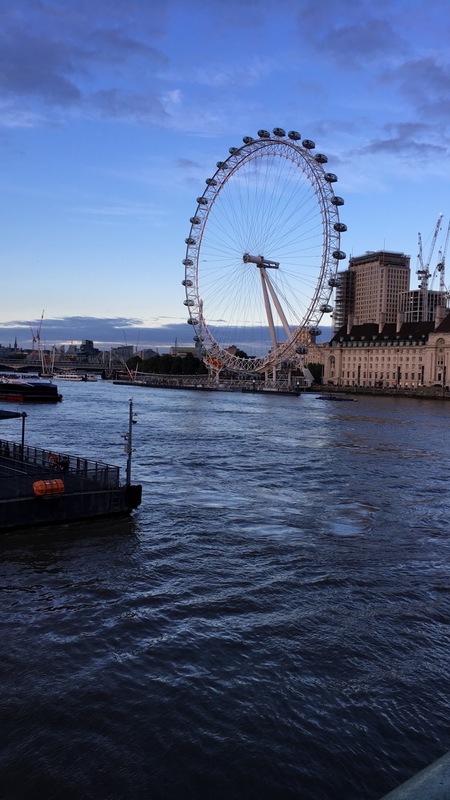 First, we saw Big Ben and the London Eye getting off the train. Right now Big Ben is going through some restoration work so it is not ringing. We ventured to many places including Tower Bridge, The House of Parliament and Sherlock Holmes’ house. 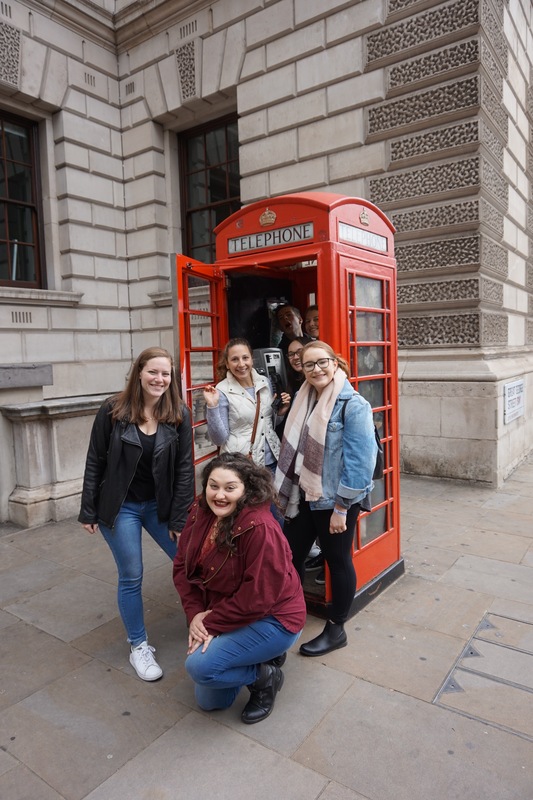 We saw the iconic red telephone booths and the double decker buses; they are everywhere in central London. Let’s just say that it is a beautiful city with so much to discover! It’s nice because my school is on the outskirts of central London, and it’s about a 20 minute train ride. 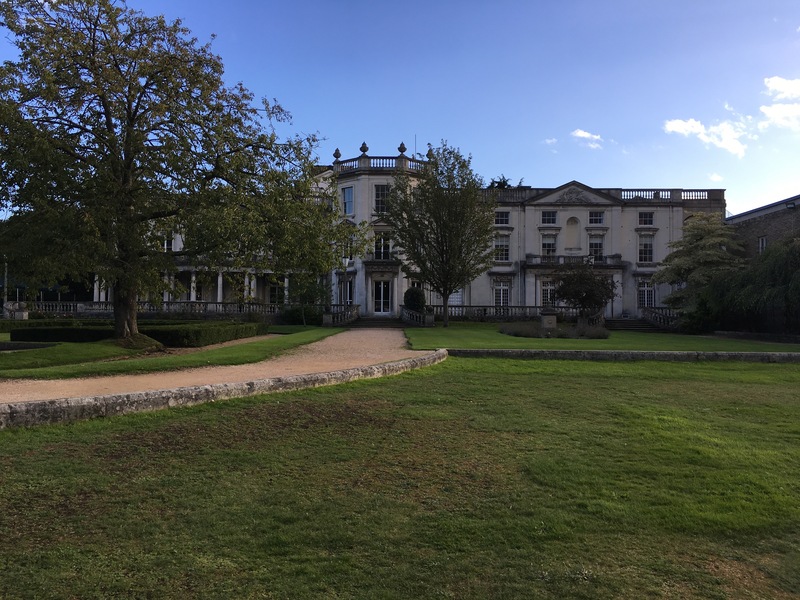 Roehampton is a city within a city and London is conveniently located, so you can go into the hustle and bustle of the city whenever you want. When you want to be away from the fast-paced city, you can explore the local areas, like Putney and Hammersith. This week I was also able to meet up with my friend Keishema, who was my sister’s college roommate. It was exciting and also nerve-wracking, because I had to take the train by myself for the first time. 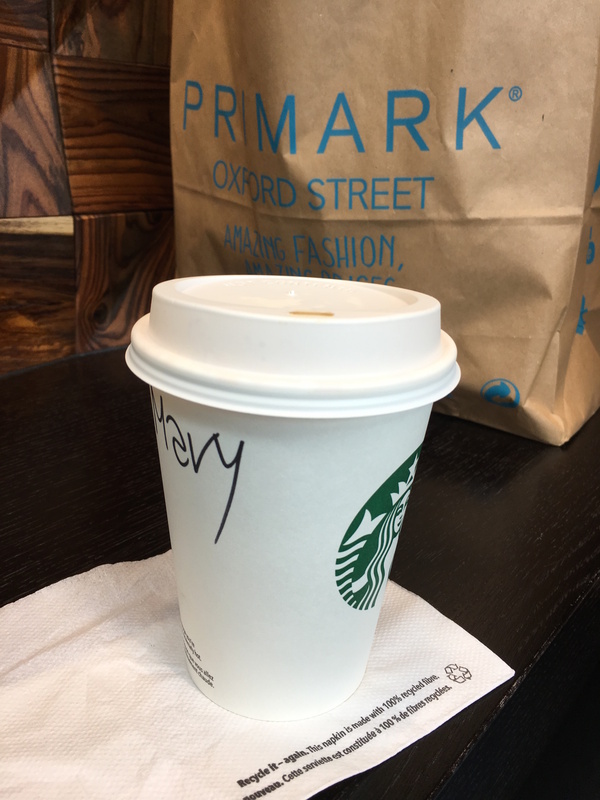 We met at Waterloo station and traveled to brunch together. We ate at The Breakfast Club, where they serve breakfast all day, which was amazing because breakfast is my favorite meal of the day and the most important. Keishema said that each time we meet up she wants to take me to a place that I haven’t been, so we went to London Bridge, Oxford Street, Carnaby Street and The Covert Garden. Each time I explore London it gets prettier and prettier! Next week classes start, so stay tuned for more intel on what classes are like on the other side of the pond. Hi, everyone! My name is Mary Warfel, and I have just embarked on an incredible journey of self-discovery and exploration. 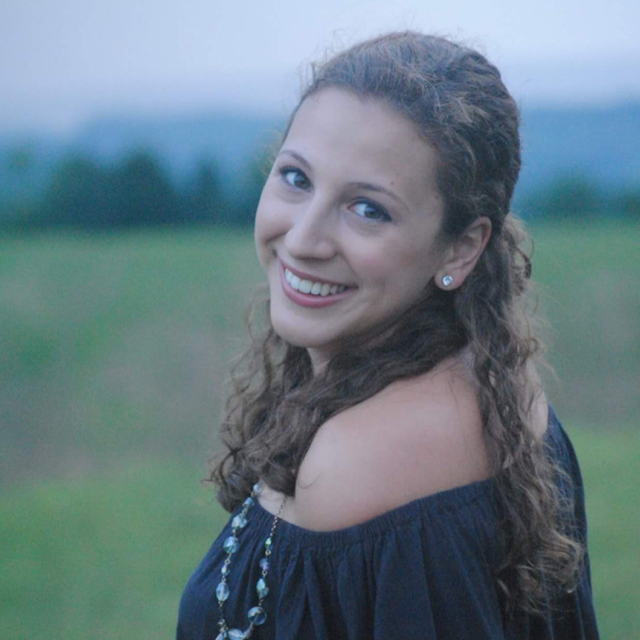 I am a senior at Utica College, majoring in public relations. I live in Clinton, NY, which is not very far from Utica so I have been commuting to school for the past three years. That being said, I wanted to experience something different besides living at home, going to school and working. So I decided that studying abroad was probably the best option for me. I thought England be a cool place to explore, and it’s also a place where I have a support system already built in; my sister had two English roommates her senior year of college, and they became family to me. Now I have ventured across the pond to discover what life is like an ocean away. I arrived last week on September 6 and stayed with the Hunter family in East Ilsley. They showed many beautiful places including, Lamport Hall, Oxford and Basildon Park. Lamport Hall is set in the countryside of Northamptonshire and has withstood many years of changes. 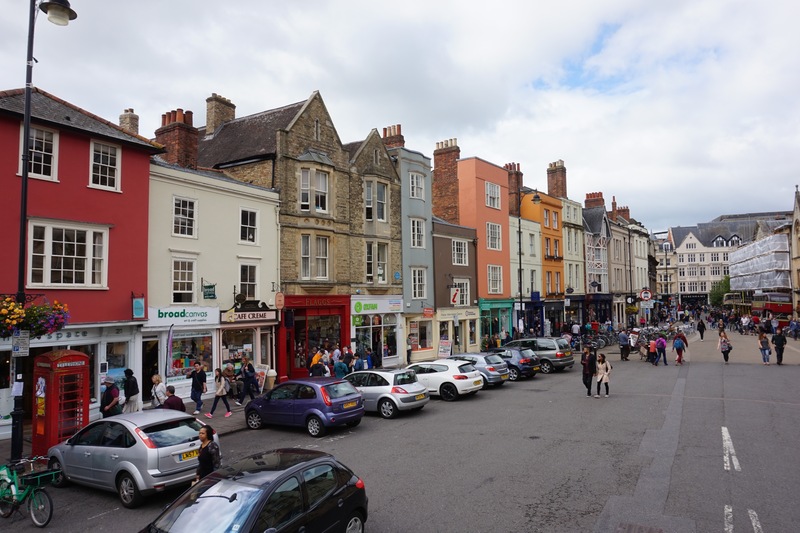 When I was in Oxford, I went on a guided bus tour around the city. Fun fact: When Oxford University first allowed women to study, they were able to take classes and sit for exams and pass them, but were not allowed to obtain a degree or diploma until the 1920s. 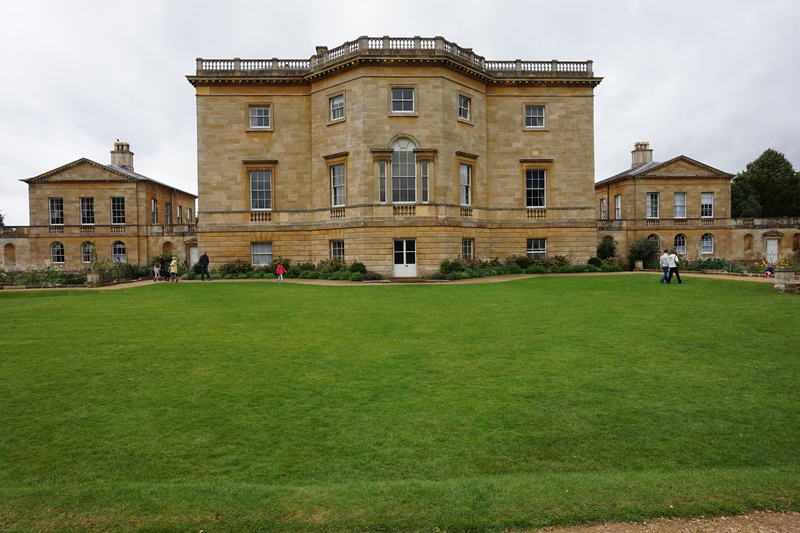 My next stop for the week was Basildon Park, which was a house that was established in the 1950s. Since then, it has been the back drop to many television programs and movies. Part of the movie Pride and Prejudice was filmed there and the British TV drama Downton Abbey was filmed there, as well. Some major episodes were filmed there such as Lady Rose’s wedding and the Christmas specials. I loved Downton and was super excited when I found out that part of the filming was done there. My next stop is the University of Roehampton where I will be studying for the semester. Stay tuned! 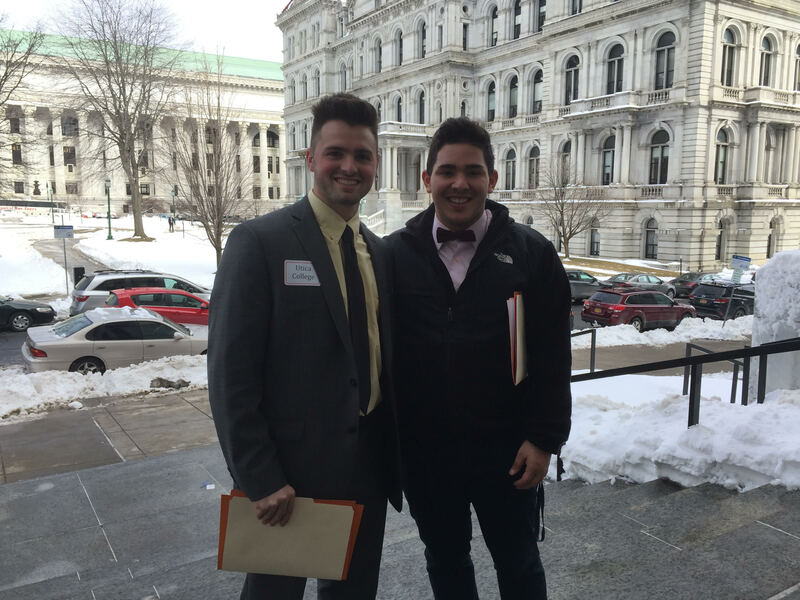 Why did you get involved with Student Advocacy Day? I wanted to attend Student Advocacy day because I thought it would be important to voice the opinion of the school. Some people don’t have such an outgoing personality and wouldn’t be able to talk to someone with such status as a Senator, so it was an honor to talk on behalf of Utica and other small college institutions. Issues of student aid affect a plethora of students statewide, and they need to be talked about and discussed in order to have the best outcome possible for all parties. Why are student aid and opportunity programs so important? The aid we receive is vital to many students and their families. It’s important because not all families can afford to front the money for their kids to attend college, and in today’s society a college degree is required to apply for many jobs. Aid helps level the playing field in a sense, and makes earning a degree more affordable. What did you learn from your experience in Albany? I obviously learned how much it means to many students to have the financial aid from the government and from other scholarships. However, I also learned how important it is for lawmakers. 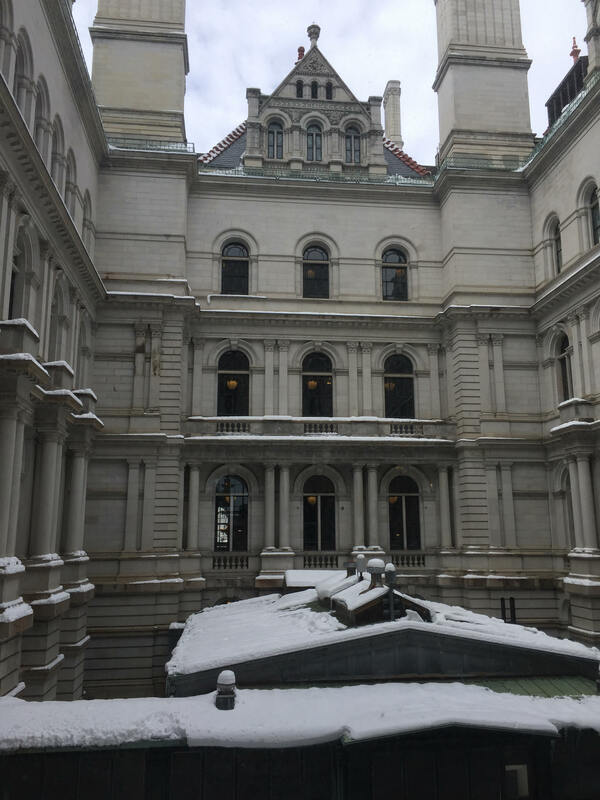 Most of the lawmakers we talked to seemed to have a similar view on the situation; with the way the Governor Cuomo has proposed the free tuition plan, there are flaws that need to be ironed out. Overall, it was an honor to be invited and represent Utica College and other small institutions, and I would absolutely do it again. When did you decide to take part in the Women’s March? Was there one distinct moment that inspired you to act? Is there a particular cause that is important to you? 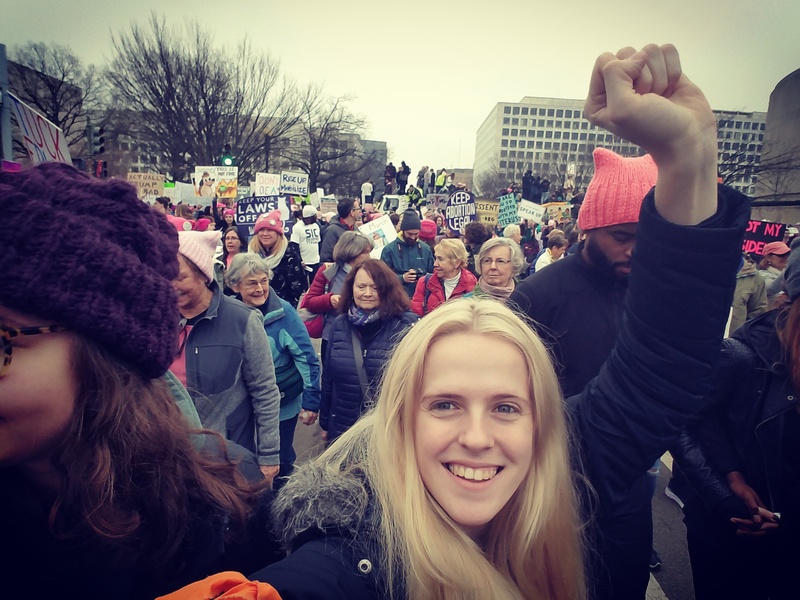 I decided to take part in the Women’s March as soon as I heard about it from my advisor during one of our K. Della Ferguson Womyn’s Resource Center meetings. There was not really one distinct moment; it was more of a collective response in regards to my feelings towards the sexist rhetoric used during the election. Once I heard and saw on TV that Trump was normalizing sexual assault with certain phrases he was using, I knew I needed to take action. I am also a firm pro-choice supporter and it blew my mind that a female’s right to her own body was being attacked yet again. Describe the trip to D.C. I traveled to D.C. on one of the buses that was leaving Hamilton College. There was a variety of individuals both from the Utica College area and Hamilton College area that wanted to go. It was a one-day trip. We left Hamilton College around 1 am on Saturday and came back on Sunday at 4 am. What was your first impression when arriving in D.C.? We first stopped at Shady Grove metro station, about an hour from the city itself, to catch the train into D.C. Just at this stop, the crowd was already huge. There was so many people, and we had to wait around an hour or so just to get onto the train just because the crowd was so big. Every stop along the way to Washington D.C. filled the train a little bit more. 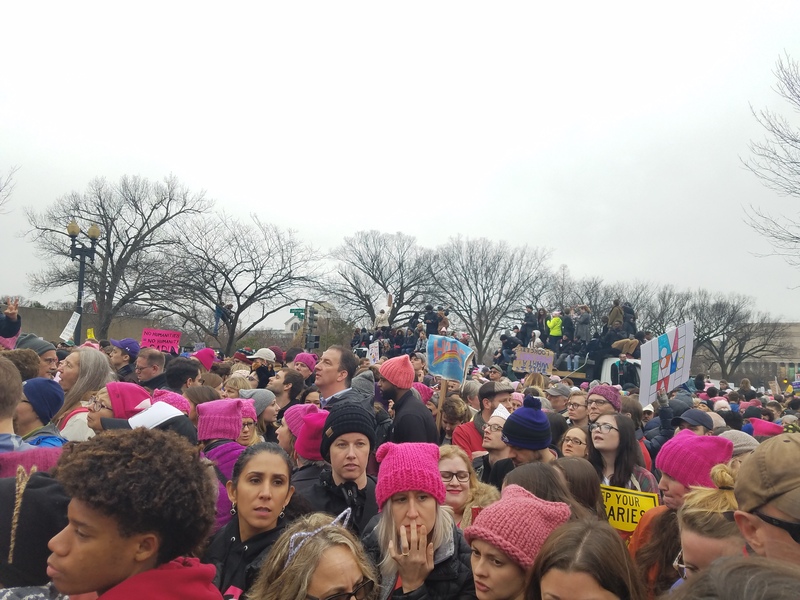 When we finally got to Washington D.C., it was a sea of people. It was incredible. How would you describe your fellow marchers? My fellow marchers were positive, peaceful, and empowering. Honestly, all of them were memorable. 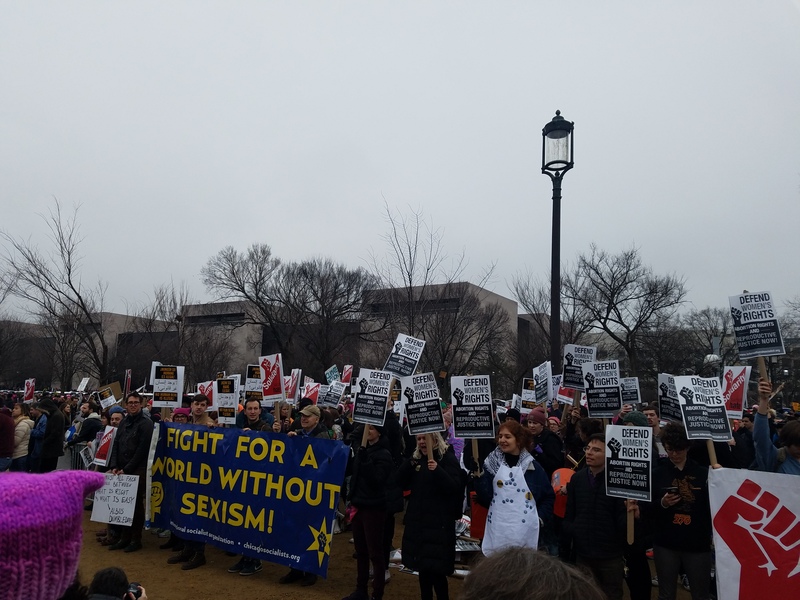 It was a weird experience for me because even though I did talk to a lot of the marchers, we all felt like one big unit. I think the interaction that will stick with me was when a marcher on the bus kept offering everyone cookies. It was a great thing to sit down to on the bus after a long day. Plus, his cookies were delicious! 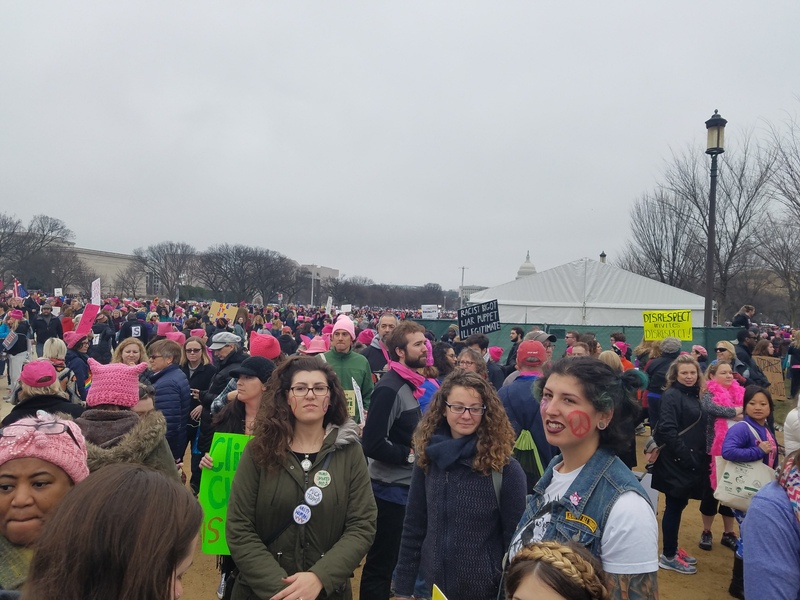 Describe some of the signs and outfits you saw at the march. I saw suffragette outfits and the signs they held up said something along the lines of “I cannot believe we are still protesting this.” I saw was doctors wearing lab coats and nurses wearing scrubs advocating for universal healthcare. My favorite outfit was a nurse who wore green scrubs and held up the torch like the Statue of Liberty. What’s your opinion of how the media has covered the march? Did they get it right? The only coverage that I saw was the aerial views of how massive the crowds were, and they definitely got that right! Describe how it felt to be part of the march. What was the overall vibe and message you felt was being communicated? I felt safe and strong. It was so unifying, too. Everyone was together and it felt like nothing could break us apart. What effect do you hope the march will have going forward? 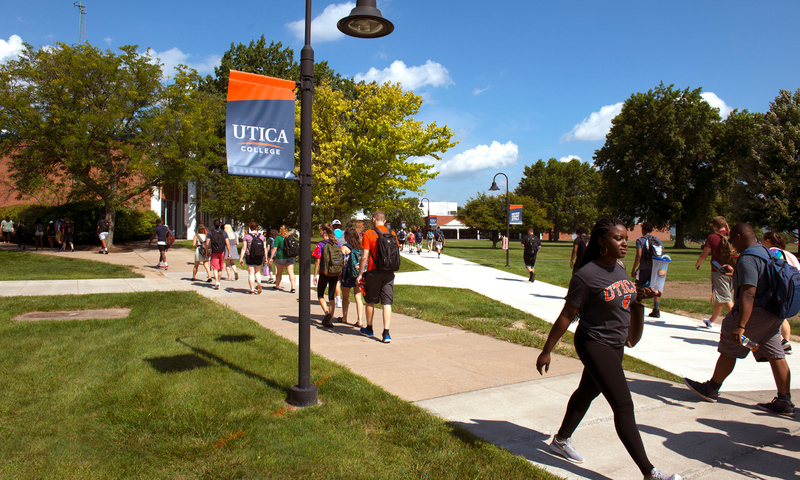 Guest post by Kelly Adams, Assistant Vice President for Marketing and Communications at Utica College. It’s a small world, indeed. I looked up and across the aisle from my seat on the Disney Magical Express airport shuttle, and was greeted by a woman with an unmistakable Tennessee accent who was seated barely an arm’s length away with her husband. She motioned with her eyes to the similarly unmistakable moose logo on the breast of my UC pullover, presumably so as not to unduly alarm me. “Our son graduated from the Economic Crime Management master’s program,” she volunteered, before we proceeded to spend the next 40 minutes of our commute from Orlando Terminal B to the Magic Kingdom discussing our UC connection. My wife, a UC alumna herself, and I would later half-joke that we can’t go anywhere without running into a member of our extended Utica College family. But the first day, let alone the first interaction of the vacation? The first was far from the last. Only hours later, my orange, Trax-logoed quarter zip was spotted again. As I shouldered my way through the jubilant chaos (Disney speak for unforgiving crowds) of Disney Springs, I stopped to let a stroller through. We chatted, exchanged favorite stories of our time at UC, and soon discovered we shared several mutual friends. 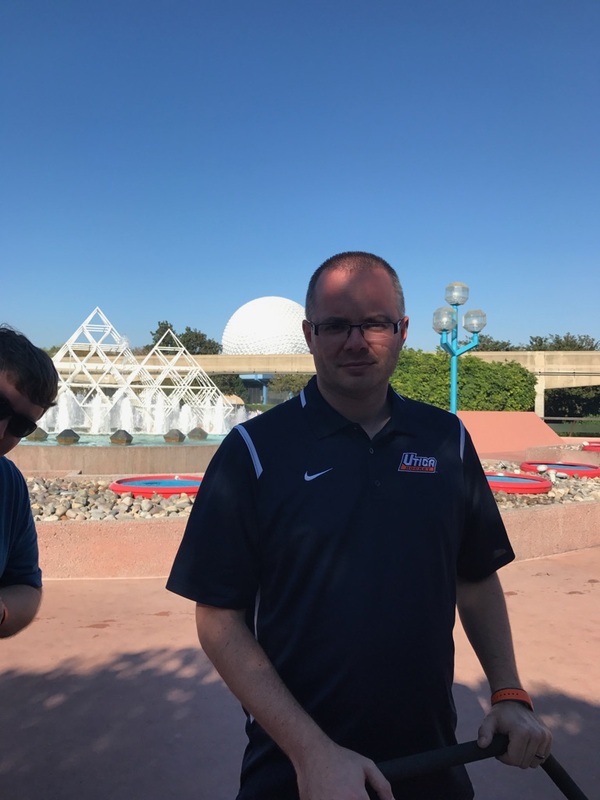 The week would not be complete without another UC chance encounter – this time with a young woman who sold me a Mickey-shaped soft pretzel the size of my youngest son’s head, who, as it happens, was the daughter of an 80s UC grad. She noticed my UC hockey t-shirt. Well, for starters, my casual wear wardrobe is obviously lacking in variety. Moreover, if you’re traveling, don’t forget to pack a UC shirt. You never know when or where you’ll bump into a fellow Pioneer. It’s a small world after all (hokey, I know). 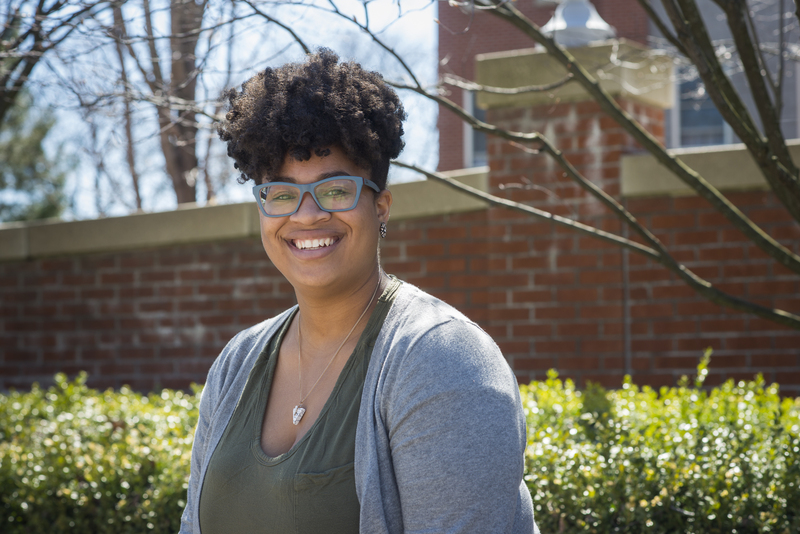 My name is Azure Garrett ’17, and I am currently the President of Alpha Phi Omega, a co-ed national service fraternity on campus. APO is very focused on service, so we were happy to work with Student Activities on the second annual Service Day at UC! 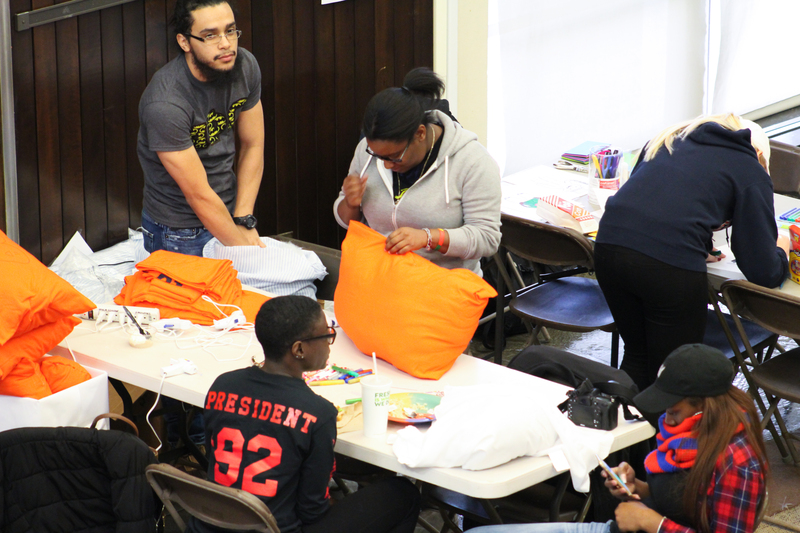 This year, we thought of some new service activities we could do at the event on Oct. 26, including making pillows for nursing homes and goodie bags for children. APO values service and a lot of activities we do are based around service, especially service to our school and community. This event definitely gave us the opportunity to do both of those things. Service is always something I have been interested in, but it is very hard to do as an individual. Joining Alpha Phi Omega gave me the voice and resources to not only think about doing service, but by going out and doing it with people who have the same interests as me. As a group we are constantly thinking about ways to give back to the community. It’s nice to be able to do someething with a great group of people, and not expect anything in return. Personally, I have always enjoyed being involved. I hate the feeling of not being able to help. I like staying busy and what better way to do that than by volunteering? With volunteering, I am able to work with all types of people, from children to senior citizens, and gain new perspectives on different situations. I learn more about myself and the community through service. As President of APO, I encourage all students at UC to get involved in service, because it makes you a well-rounded individual and it teaches you to give back and have empathy for people. I believe it is our social responsibility to help each other out in all ways possible. 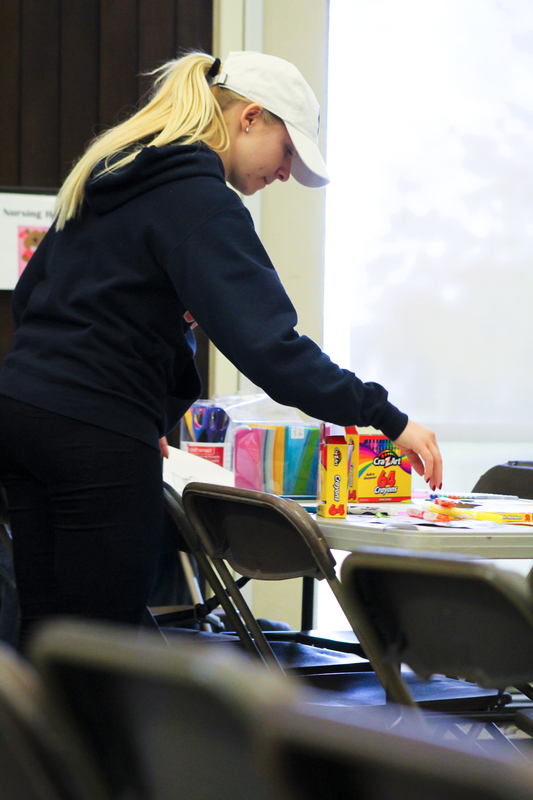 At this year’s Service Day, a lot of UC students were excited to get involved. Sometimes I find it hard to get UC students involved in activities that don’t give them incentives, and the fact that so many students were willing to give back to the community without expecting something in return is a great sign that UC is growing in more ways than just physical.